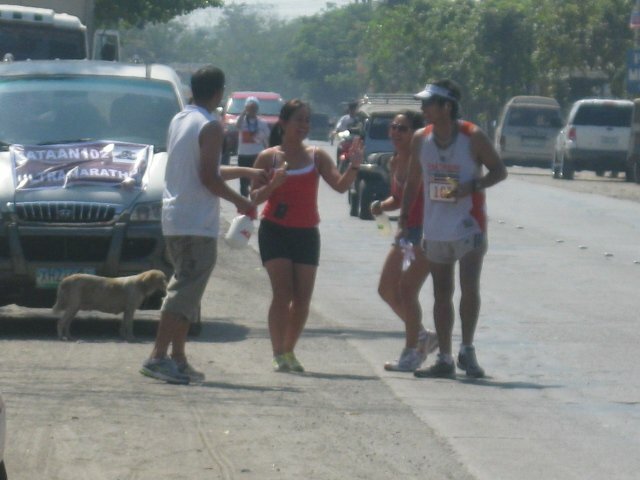 "After 42.195 kilometers, everyone turns into furry animals with funny names"
Kilometer 52, somewhere in Bataan. 7 :17 am. Nearing the halfway mark, one would somehow grasp a palpable sense of accomplishment having completed the ultra distance already. At this point, 99% of the population would have called it a day , limping gingerly to their cars while prepping for breakfast at Mcdo 32nd Street or Paul Calvin's. But alas, this wasn't BHS. We're not pampered pansies anymore. I'm right smack in the middle of nowhere with the heat steadily climbing. At this point, you're doggone tired. And yet, the lurid element about the whole thing is you have nearly have a day to do it all over again. Still alive and strong at the 52k mark. 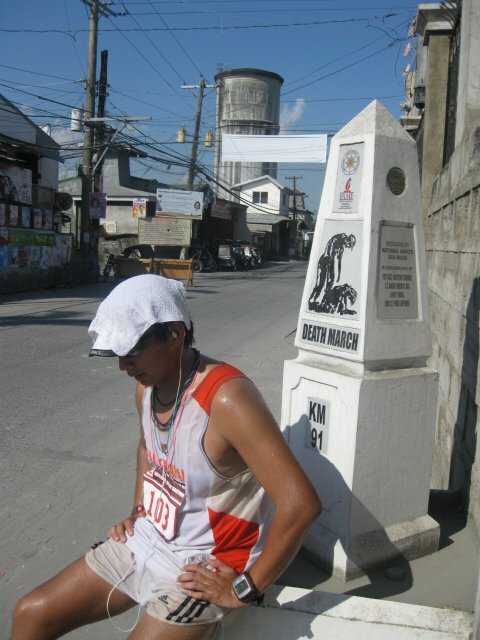 Kilometer 56, still somewhere in Bataan, I can't keep track of time anymore. An essential rule that I apply is that before every race, make sure you have ample restroom time to unload whatever needs to be unloaded. Anxiety and excitement make for a potent tummy-churning mix. Unfortunately, the "posh" accommodations at our "hotel" weren't too inviting. Suffice to say, I ran on a full stomach. Which became even fuller after ingesting practically everything that was on my "buffet on wheels", some which were completely mismatched. Thus, something had to give at one time or another. Great. So after nearly 8 hours of running, I had to go. And that's where the fun started. I couldn't allow this to happen to meh! Ewww. GBM : Kuya, pwede ho bang makigamit ng CR? Kami ung tumatakbo mula Mariveles hanggang San Fernando. Manong : Ay pagkalayo ah! O cge dito na lang pasok ka. Pero pagpasensiyahan mo na ang banyo namin. GBM: Ah, ummm, ay kuya iihi lang sana ako eh! Manong : Ah ganoon ba, akala ko dudumi ka? GBM: Ay hindi ho, naiihi lang talaga! Manong : Eh para saan yang tisyu? GBM : Uuh, para sa pawis lang ho! Well, this wasn't a purely kaartehan decision. Squatting over the Neanderthal-like hole could have run the risk of cramping me up. After all, 56 kilometers is 56 kilometers. So as I made a beeline for the exits, I just realized I had lost 10 seconds of precious pace over that. Ugh. It's a hole in the ground for crying out loud. 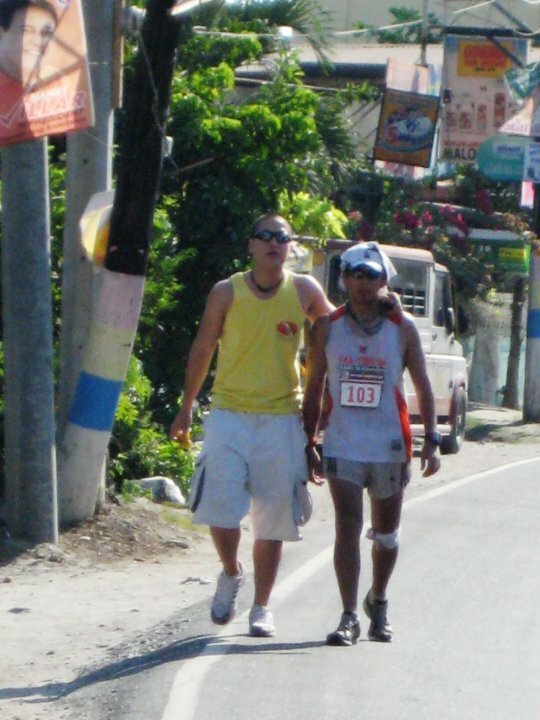 Kilometer 57, still somewhere in Bataan. Time is the last thing on my mind right now. I had AJ and the gang look for anywhere clean. This was slowly turning into a national catastrophe. Option number one- Funeraria Hidalgo. Pass. Option number two - a clubhouse inside a subdivision. Problem was, the clubhouse was at least 500 meters away from the gate along the highway. Great. I didn't even dare consider riding the car because obviously it isn't allowed. 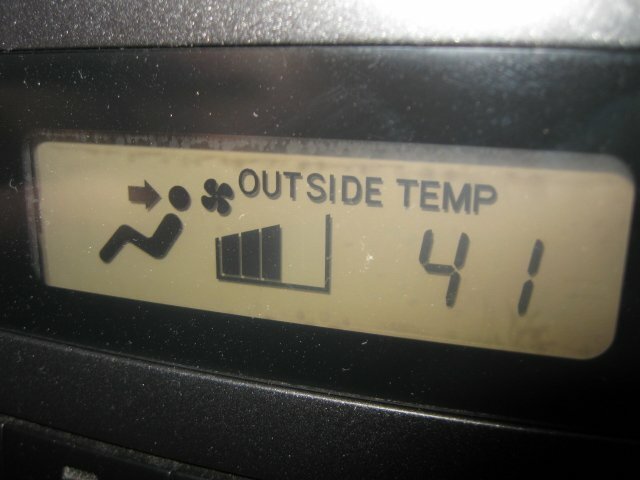 With the temperature steadily rising , the extra 1k did not help any. I was losing hard-fought time and pace with these detours. To further exacerbate things, the efficascent oil that we had been using for rubdowns apparently did not jive well with my fancy P650 sunblock (ulk) and well, the sun itself. My legs felt like they were literally burning. Like you poured an entire bottle of Omega on it or something.Bad decision! Dang. By the time I had finished going to the restroom and had the efficascent oil washed out, I had lost more than 35 minutes already. Great. It burns, it burns.Km 65, somewhere hot in Bataan. Around 10 am. After that fiasco, crew chief AJ told me that Abby had just passed me. I hadn't seen her since the start of the race so I decided to catch up with her and say hi. At least I could somehow make up for some lost time. I tempo ran about 3k at 6:20 pace just to get to her. She was in full focus mode, and even my fun Gingerbread jokes would not work on her. She would later tell me that if she had any energy left, she would have punched me in the face. Smirk.For a certain stretch, we were going back and forth. I would leave her, then she would catch up as Aj and RV would methodically hose me down and drape me in ice-cold towels because the heat was somewhat of a joke already. It was fun though, because it was like we were sharing two support cars. Carina, Joni and Z all helped immensely in hosing me down and giving me foodies. Good morning towels save the day!Abby had a crazy yet effective strategy that entailed NOT STOPPING at all. She even brushed her teeth while on the go. Amazing. Eating the dust of intense Abby. Taking up the cudgels for alpha males everywhere. 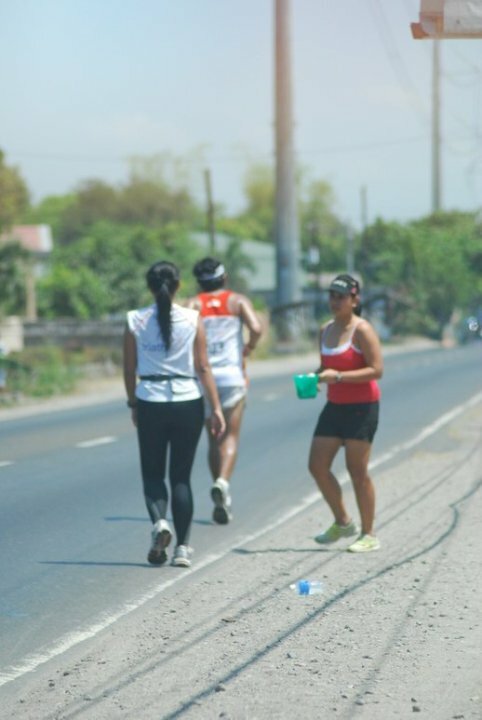 Km 70, somewhere very, very hot in Bataan. I could care less what time it is. It's hot. Really hot. Exag hot. Scrambled eggs on the pavement hot. Somehow, I couldn't quite describe to you how ridiculously hot it was that day. Only later on were we informed that the heat actually hit 41 degrees on the thermostat. If you factor in the heat seeping out from the asphalt, it could have easily been hotter. HOT. The only way I was able to survive was by being soaked in ice cold towels and being hosed down head to foot every 10 minutes. Everything was starting to look like a mirage. I was starting to be extremely crabby brat to my crew already. I refused to eat anything, even a Jollibee spaghetti that would have been yummy in ordinary conditions. AJ was force feeding me, and I would throw away food when he wasn't looking (heheh). It came to a point where my words had escaped me already... ..
Km 72, I don't know where the crap I am. It's time... to quit? No. NO. NO!!!! Just as I was settling into some semblance of a comfortable second wind along with a good rhythm with the crew, I felt a familiar pain on the outer edge of my left knee. 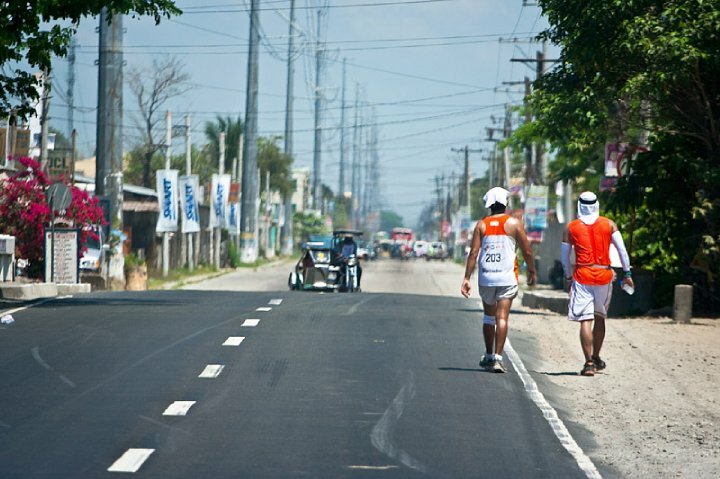 Visions of walking the last 12k of Globe Run For Home last year came flooding in. No. Not today. Please. As the dreaded pangs of ITBS started to kick in, I was panicking inside. I have 3/4 of a marathon to go, I can't put weight on my knee anymore. A combination of frustration, panic, exhaustion and sleep deprivation suddenly all kicked in, and before I knew it the tears were welling. Good thing RV's shades provided my macho image some decent cover. How the crap was I supposed to finish this thing?? Sob. Sniffle. Mommyy. End of the road for GBM?I was at an all-time emotional low. Depression. Angst. Abby just ate away at the lead I had built. Now she was gone. Everyone was passing me. Doc Art and Argow were going strong as I struggled mightily to catch up. Alas, my body simply had nothing left to offer. And here I was, legs pretty much a useless pile of rubber. I was already thinking of a lame excuse for not finishing. Sigh. Thank God for AJ. As my best bud/crew chief, his calm and rational words implored me to solider on when I couldn't get up for the count anymore. Check your competitive streak at the door. Forget your lead. Pace. Time. Whatever. Forget who passed you. That doesn't even matter now. 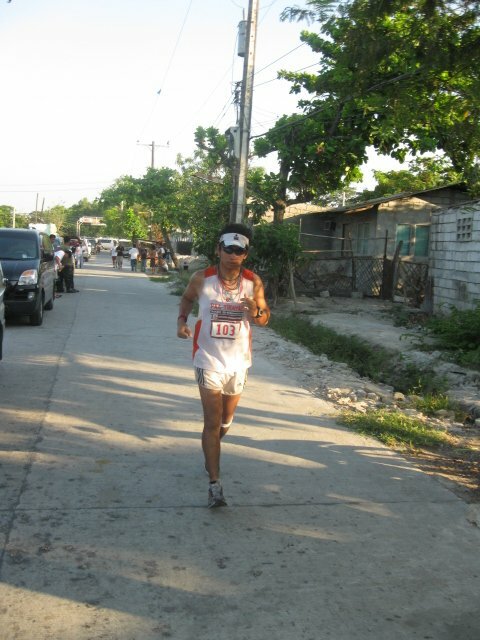 The one thing you should be concentrating on is to finish this race in one piece. We didn't go all this way just to see you quit. Later on he would tell me that he should have watched all the inspirational movies he could, because he was running out of lines. Lol. Good thing AJ watched a pirated DVD beforehand. Kilometer 80. 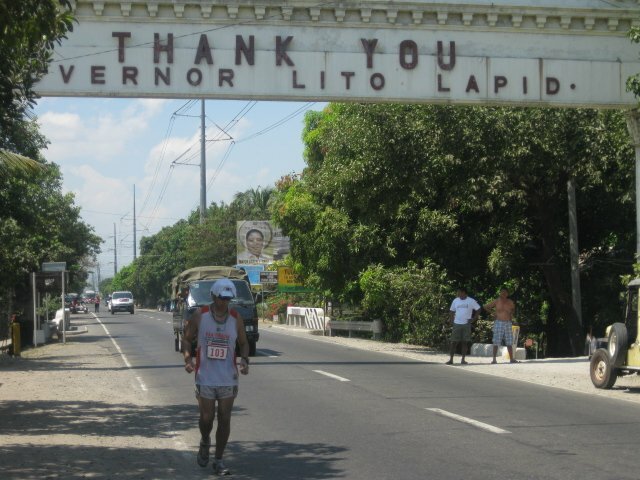 I saw the Lito Lapid Sign So This Must Be Pampanga. 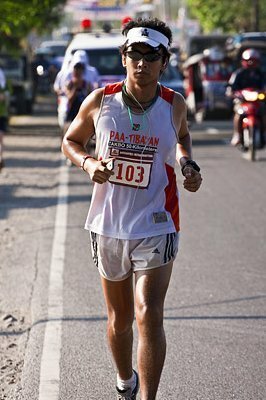 Kilometer 72 to 80 was probably the roughest stretch of the entire race for me. The pain on my knee was immense, and I was continually on the verge of quitting. Everything seemed to grind to a standstill, inch by painstaking inch seemingly rendered in stop-motion animation. What felt like five kilometers was in reality only one. In my deranged, sleep-deprived state I was admonishing the crew for being too far in between stops (to aspiring BDM support crew out there, it's an occupational hazard). I told them, Every 500 meters!!! I would learn later on that they were actually waiting for me at 200 meter intervals. Oops. Kilometer 82. People speaking in tongues. I think I just saw Grimace in front of me. 2pm? Fading. Fading badly. 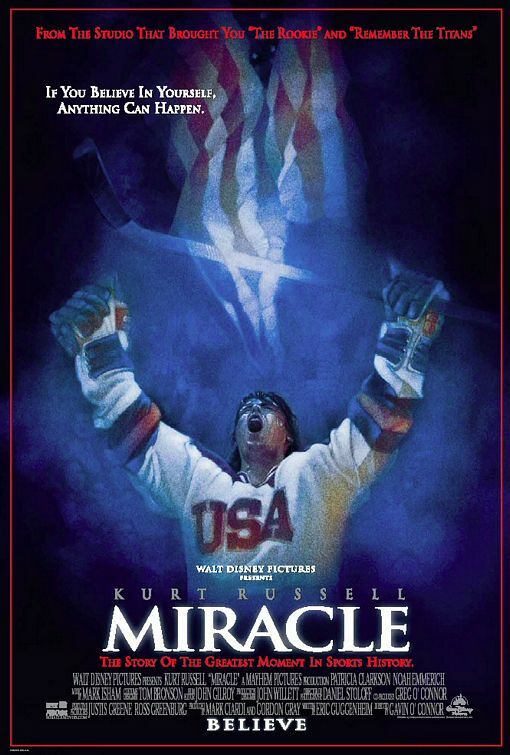 At this juncture, I feel like there's nothing left in the tank. I must have fallen asleep while running, as i was jarred back to consciousness by the afterburn of a bus that was about 2 feet away from me. I felt like climbing an summit-less Everest. I was all alone, and weird thoughts were starting to get into my head. Like, !@@##$%%!!!! was I doing this to myself???!!! Enter Mark. 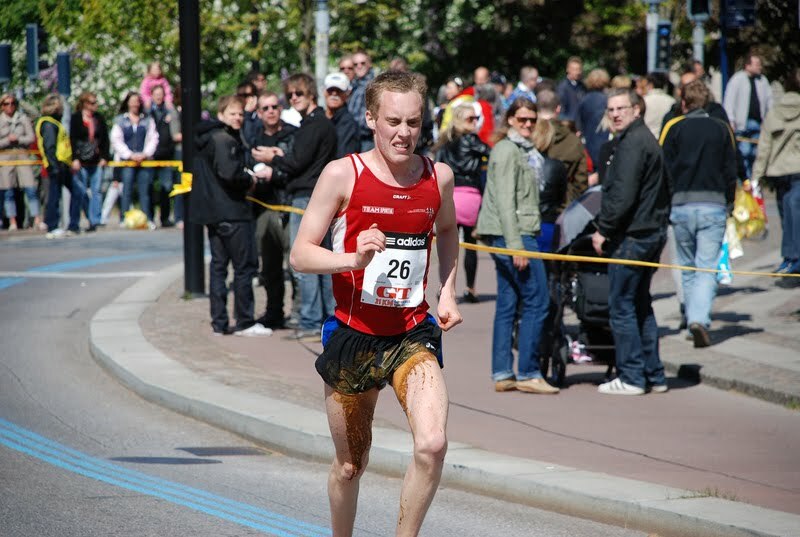 A regular pacemate during the road race season, this athletic wunderkind seems to never tire at all. At just the precise moment that I was completely spacing out, his presence helped me greatly. The casual conversation took me out of my zombie-like state, and just having someone around seemed to have a tremendous effect on my sanity. We felt like we were in some bizarre reality show, and we would somehow manage to alternate between incessant laughter and incessant whining. Heading into the homestretch, I was really liking our chances. Move over Marc and Rovilson? 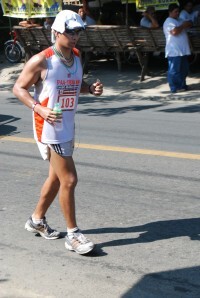 Kilometer 87. Guagua,Pampanga. Need air. At this point,we were alternating between giving up and giving a motivational speech to one another. The heat wasn't cutting us any slack at all. We were trying to play the numbers game if we would still make cutoff. 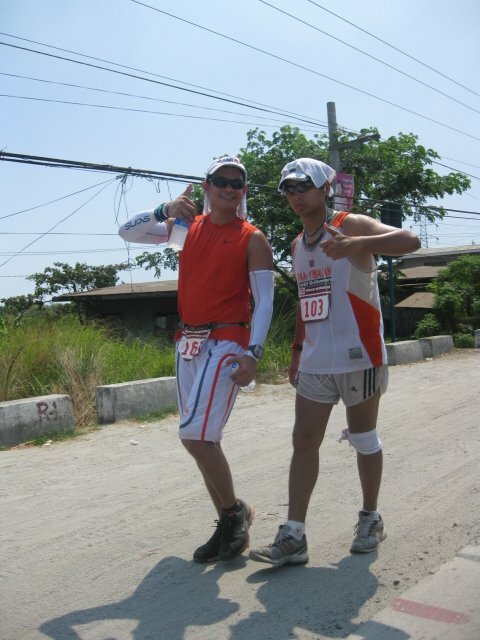 We sure were a sorry sight, me stopping every 5 minutes due to the ITB, Mark due to severe cramps. Our run-walk ratio was plummeting by the minute, two warriors extended to the very limit. At a certain juncture Mark just sat on the sidewalk and said he was giving up, he didn't care if he would be swept anymore. Being able to empathize with what he was going through, I gave him my best Braveheart, pain-is-temporary-quitting-is-forever speech. And soon after he was shuffling along behind me again. Pure blood and guts. It was winning time, and suddenly all of the stopovers we were making had made it into a race against time. 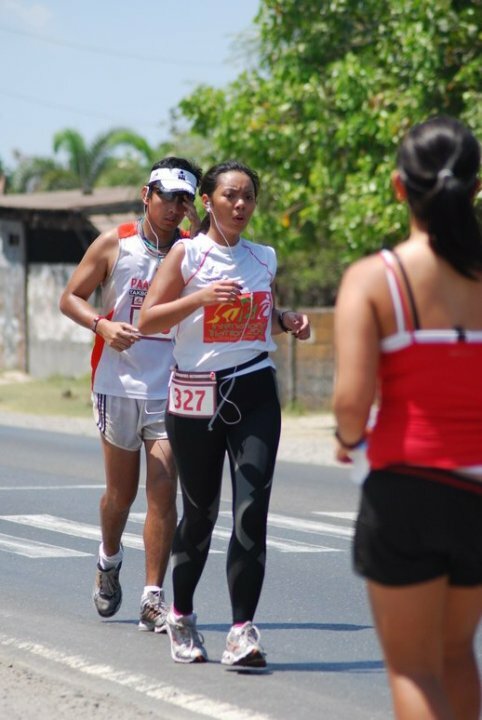 Kilometer 92. San Fernando, Pampanga. Two and a half hours to finish 10k. From this point on, everything seems like a blur to me. 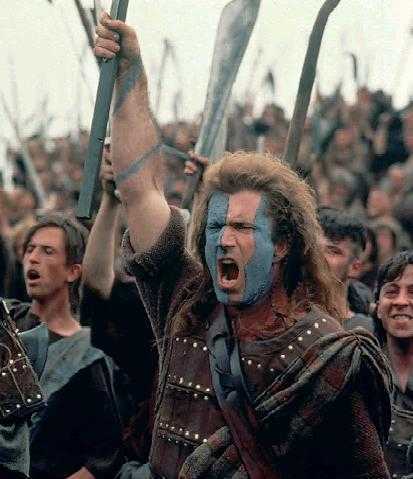 From what I recall, I lost Mark, there were people fighting in the eskinita ( !@#$^!! wag mong bastusin gerlpren ko pare!!) and the pain in my left knee grew in intensity with each pause. My crew was pulling out all the stops to ensure that I made it. The pain was incredible. But to quit this near, after all that you've been through? No way in hell. If you told me that I had to roll down the road just to fini sh, I would have. Don't even think about it GBM. 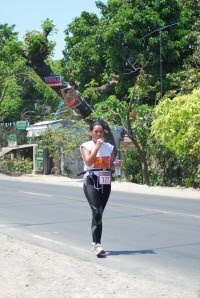 Kilometer 101. City Capitol. 4:50 pm. 36 straight hours of lucidness. Mariveles. San Fernando. Finally, the insanity was coming to an end. At that precise moment in time, nothing seemed to matter anymore. Just sheer unbridled joy at making it through this life-altering journey, along with tremendous gratitude towards those who had made it possible. Words escape me now. I had said too much anyway, and those of you who had made it this far must be deathly bored. The high is like nothing you could ever experience. Nothing even comes close. BDM is a beast. I must have told myself I'll never ever do this again at least 20 times. It humbles you. It strips you down and swallows you whole. It changes you. After all that I just went through, only then did I understand the intricacy of it all.Why these warriors go through all that pain. That suffering. 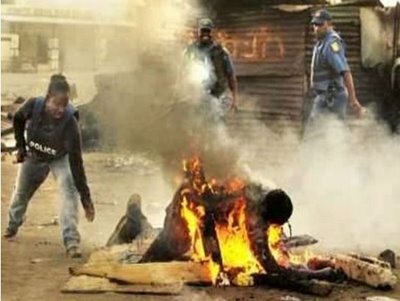 Why would they willingly subject themselves to that type of punishment over and over again? The long journey over... At that precise moment in time, as I was approaching the finish line, as I was hearing all the cheers, it all made perfect sense. It's not something that can be encapsulated by a mere scribe's hyperbolic lamentations. It's something you have to experience yourself. So with that said... .